In the morning we walk or bike through our neighborhood west of Yoyogi Park in Shibuya, Tokyo, to our son’s bus stop. Along the way we pass more people walking and biking than cars. School children dressed in uniforms are walking by themselves or with friends to school, their backpacks covered in bright safety stickers. If I’m thirsty I’ll grab a drink out of a vending machine or one of the konbinis (convenient stores). 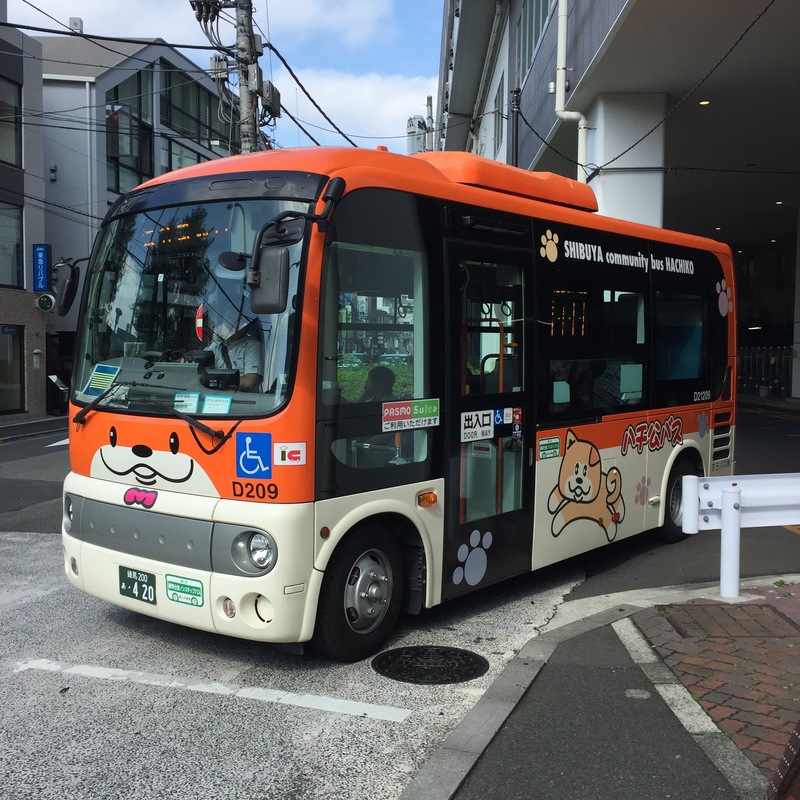 Colorful buses covered with cute characters are heading to international schools. Small corner vegetable stands are just opening up with brightly colored oranges and other seasonal fruits and veggies. A lot of people are wearing face masks, hay fever is bothering a lot of people. You can hear the sniffing behind their masks; blowing your nose in public is not polite. The bicycle parking garages are just starting to fill up. It costs 100 yen to park your bike for 24 hours. It’s a good day when I don’t have to quickly get out of the way of a mamachari (electric bike). We hangout on the street with the other parents and school kids to wait for the bus. Like everyday, we spot the driver that uses giant dusters to clean his parked car. After Ripley is safely on the bus and enroute to his school, we head back to our house. Sean makes me coffee. I head to school on the community bus. Just 100 yen gets me to Shibuya station. It would take me about 25 minutes to walk, but I use the time to study new vocabulary words. I also like the vibe on the bus, everyone is very polite and cheerful…a much nicer feel than the trains. On the bus, if an elderly person comes on, they immediately get up from their seat to offer it. On the train, that doesn’t tend to happen, there’s a lot of head down mentality so as not to give up a seat. Sean made a good point about that, if you have a long commute, you don’t want to give your seat up for someone that’s only hopping on for a few spots. That doesn’t change the fact that the seats are reserved for those that really need them. That leads me to sniffling. OMG. From what I’ve been told, it’s really not polite to blow your nose in public. That’s why everyone is constantly sniffing. It’s accepted. Yesterday I was on the train and someone took their mask off and blew their nose. I was in shock. Also grossed out as we were in very close quarters. So I guess I’ll put up with the sniffing. But I’m never going to get used to the slurping. We were at a vegan ramen shop at next to us a guy was slurping so he could be heard above the noisy restaurant. I have misophonia and chewing and crunching and slurping noises literally make me insane. I had to put on earphones. Slurping I guess means you like the food. I think saying “oishii desu” does a much better job. But hey, who am I to judge. Back to the bus ride. I get off at Shibuya Station which is where the famous Shibuya crossing or scramble is. It’s always busy no matter what time I’m there. Undoubtedly there are always people filming people crossing the street. I wouldn’t be surprised if it’s one of the most photographed and video’s places on the planet. When I was a tourist I thought it was so fun, now I can’t wait to cross the damn street and get to where I’m going. 7 months in and look at me, a cynic. I like my school. It has been a difficult adjustment going back to school, and Japanese is pretty darn difficult, but it’s a pretty awesome feeling when all of a sudden you can understand a little bit of what people next to you are talking about, or what the announcements are over the train loudspeakers. I’ve never grocery shopped so many times in a week as I do here. One, we don’t have a car. Two, we don’t have Whole Foods. There are a few grocery stores within walking distance, but everything is in small packages, so a bag of frozen peas that we bought in the US might last us a couple meals, here, we’re lucky if one bag can be split between the three of us. I haven’t worked out if groceries are more expensive here or not, probably about the same. There are little vegetable and tofu stands which I love. We are pretty shy about buying veggies and fruits from the tiny stores because usually the owners are watching TV and we don’t want to disturb them. LOL. The other thing about grocery stores here is that the aisles tend to be narrow and short. And there are usually more people. So it leads to a very frustrating experience trying to get around people. Now that I think of it, I don’t think I’ve seen a proper cart, you get a basket and there are mini carts for your basket if you need it. It seems to be part of the culture to buy groceries for dinner every day or every other day. I wouldn’t call it a normal thing, but something that we did frequently in LA was go to the movies. We’ve cut back significantly because the western movie release schedule here is terrible. Sometimes movies that have been on DVD for months start playing here. And they aren’t usually very good movies. I think I need to start watching Japanese movies. It will help me understand the culture better for sure. Sometimes we go out for dinner as there are more vegan restaurants here. I’m trying to cook more — we either eat Japanese cuisine or western. The other night we had taco night and reminisced about the tasty Mexican food in LA.